This entry was posted on March 5, 2009 by iheartfilm. 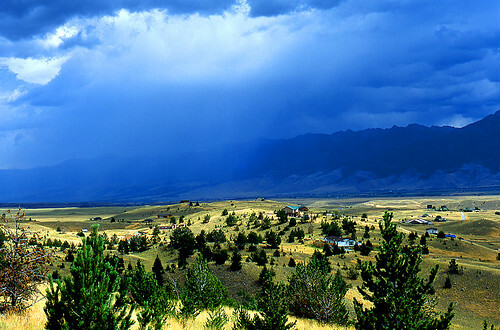 It was filed under Clouds/Storms, Kodak Ektachrome E100VS, Landscape, Summer and was tagged with clouds, epson v500, Kodak Ektachrome E100VS, Landscape, montana, nikon f100, paradise valley, storm. You’ve got some mad talent. Love the photos! wow you work is really good! You shoot on film?? I love your landscape shots! Lighting and composition is just right! this is stunning! is all the work on your blog by you? That is beautiful. I love Paradise Valley! Love this contrast in colors! Awesome! Steve – You’re too kind. Thank you. Ian – Yes, I shoot only film (nothing against digital, just not my thing). I’m glad you like my landscapes. Now if only I had a scanner that could do my slides justice . . .
Child – Yes, anything you see on this site is mine and mine alone. Thanks for stopping by. Jo – You’ve been there? Ah, isn’t it grand? Teresa – Thank you. I actually went down the hill to take some more shots and got poured on. As you can tell from the photo, there was wicked storm a-brewing. Amazing! Like come closer to the screen just to take it all in amazing! Are you going to make me start shooting color slide film too ;-)? Do you develop the film yourself or send it out? Also, do you typically do any post scan editing on your pictures? I’m reaching into my memory bank here but is Ektachrome the slide film with a blue cast? When you shoot your film do you factor these things in before you go out shooting? Lately, I have been having the hardest time shooting of all things “snow”. I keep having to totally desaturate “blue” and “cyan”. How do you film people do it??? Love the Blue, I dont think I have seen a shot you take that I dont think is great. Keep it up! Excellent landscape. Love the clouds. You are a magician with film. Nick – I have a friend I trust over at Richmond Camera’s pro lab, so I avoid developing my own slides (developing E-6 can be a royal pain). As for Photoshop, I don’t really do a whole lot. I use a flatbed scanner that hates me, and sometimes no amount of correction is going to save a shot. But for the most part, if the scan is decent, I’ll play with the contrast a little to match the slide/negative (inferior flatbed scanners like the one I own tend to underexpose and wash things out). Jean-Claude – Yes, it is. Thank you. Pat – Actually, the old Ektachrome (64 ASA) had a bluish cast (it sometimes favored brown as well). Provia also has a bluish cast, though it’s often a pleasant one. This Ektachrome (E100VS – the “VS” stands for “very saturated”) is a recent film. Every so often it has a sort of greenish cast (which you can sort of see in the above shot). Camilla – And strange – at least I think so. Thanks. Jay – Thanks. It was pretty awesome to see with the eye. The color is just amazing in that shot, I love it. You definitely need to post a link to a larger version, that deserves to be seen full screen. E100VS I see… I’ve only just discovered this gem of a slide film (mostly through its consumer cousin EBX) and I have been shooting Velvia for year but I have to say I’m beginning to even dare to think the unthinkable, that I like E100VS/EBX more! This is a superb shot though, would look great hung on a wall, something I could look at intensely and forget the passage of time. Jeremy – You’re too kind. Thank you. Serenity – It is a great film. If it weren’t so darn expensive, I’d shoot it all the time. So gorgeous! My family and I spent a few weeks in Montana last summer and just fell in love with it. Such a beautiful place you captured it so well. Amber – I was there last summer, too. Where’d you go? Just stunning. What a shot the vibrancy of the sky and lilt of mountains through the clouds is awesome. I hope it does your photo justice. Oh my! How I look forward to exploring the American landscape (though I think I’ll be quite far from Montana). thanks for viewing. Great place to grow and shoot. Bozeman is my home, but paradise valley is my favorite place on earth. I just put up a shot of of the valley from last spring run-off. enjoy. Glad you stopped by. Paradise Valley is an amazing place. I just wish I’d taken more photos the last time I was there. I’ve been through Montana before with my husband during a month of August and lightening was going on during the whole trip. This photograph is something quite extraordinary and excellent! Quite stunning! All your photography is great! Where in Montana were you? We were in Butte and then Masula (sp?). Very cool. I like Missoula. I have some friends who go to the University of Montana. Nice town.